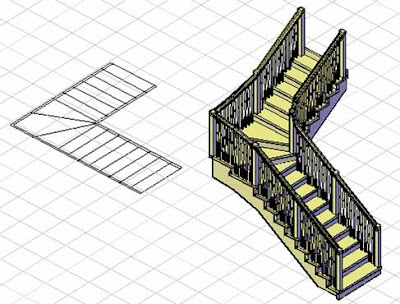 Click the link below to view an 11 minute CADclip on creating the ADT Stair you see above by using the cool 'by linework' method. This may be ADT's best unknown secret. I think it's a safe assumption to say that most people (present company included) have seriously struggled to use the ADT Stair tool to do anything other than a straight run of stairs. Heaven help you if you actually want to use 'winders'......even with the new 'winder styles'. We have all seen the red circle of death. ADT Stair winders seem to have a mind of their own that do not follow any design rules that I have come across. Well now there's a very easy solution that really works. Stairs by Linework..........from the highest hilltop........YEAH !! As far as I am concerned they can scrap the old stair tool and just leave this one in. * In the CADclip I use straight lines as the boundaries and risers but you can use arcs and polylines as well. We also learn a little bit about attaching the railings and overriding the cut plane in the CADclip lesson above. ENJOY......all my ADT friends........enjoy ! Hi Daryl, I´d like to thank you for this lesson. I had so hard work to draw a U-stairs with unlike flight lenght. And, In fact, I had to use a little trick to make it. I´d like to send you my work, so you´d give me another idea. I receive some canadians friends from Alberta in a Rotary exchange.